Check out this month’s local leaders in green. Do you know a DuPage County organization or person that deserves some green kudos? Email carrie@scarce.org to explain who you think should be one of our next Eco-Extraordinaires. A HUGE thank you goes out to all the people and organizations that took part in the 2018 Pumpkin Smash including hosts and volunteers. They were local public works agencies, churches, high school groups, environmental commissions, and more. 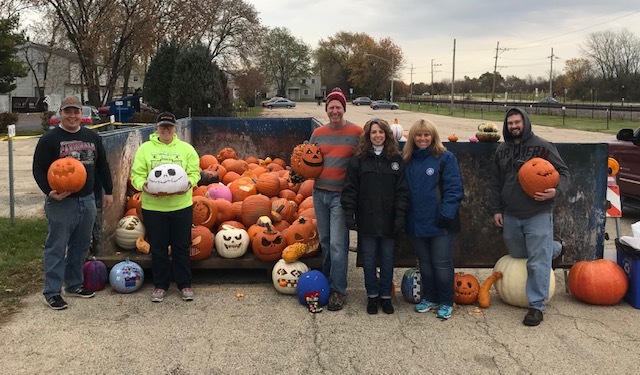 Thanks to our collective efforts there were 38 communities across Illinois where residents had the option to drop off their pumpkins for composting after Halloween. 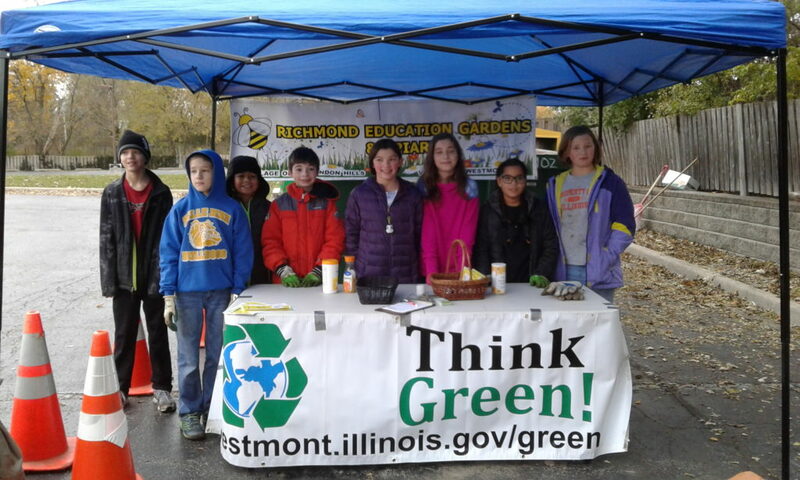 Together, we helped divert over 90 tons of organic waste from landfills, reducing greenhouse gas emissions, returning water back to Illinois soils, and spreading awareness about the benefits composting. Thank you for taking on this project and being sustainability champions for your community! Municipal Leaders: City of Elgin, City of Elmhurst, Village of Villa Park, City of Wheaton Environmental Improvement Commission, Village of Lisle, Village of Itasca, Village of La Grange Park, Village of La Grange Environmental Quality and Control Commission, Village of Westmont, Village of Carol Stream, Village of Hoffman Estates, City of St. Charles Natural Resources Commission, Village of Bartlett, Kane County, Village of Mount Prospect, City of Evanston, Village of Glencoe, Village of Skokie, Village of Winnetka, Will County Green, and the City of Park Ridge. Organizations & Schools: Roosevelt Middle School (River Forest), Girl Scouts of Greater Chicago and Northwest Indiana (Woodridge), City Farm/Resource Center Inc, Forest Preserve District of Will County, Downers Grove North High School, York Community High School ECO club, Glenbard North Green Panthers, Hanover Park Park District, Roselle Park District, Sandwich Park District, Sandwich Girl Scout Troop 785, Hinsdale South High School ECO students, Maercker School Eco Club, St. Marks Episcopal Church of Glen Ellyn, Naperville Park District, Homewood-Flossmoor Park District, Solid Waste Agency of Northern Cook County, Pushing the Envelope Farm, First United Methodist Church of West Chicago, Hoover Math and Science Academy, Mindful Waste, Lewis University Society of Physics Students, St. Charles East Science Honors Club, and Glenbard South Key Club. Haulers: GROOT, Homewood Disposal, Lakeshore Recycling Systems, Prairieland Disposal, Republic Services, Roy Strom, Waste Management, and Flood Brothers. 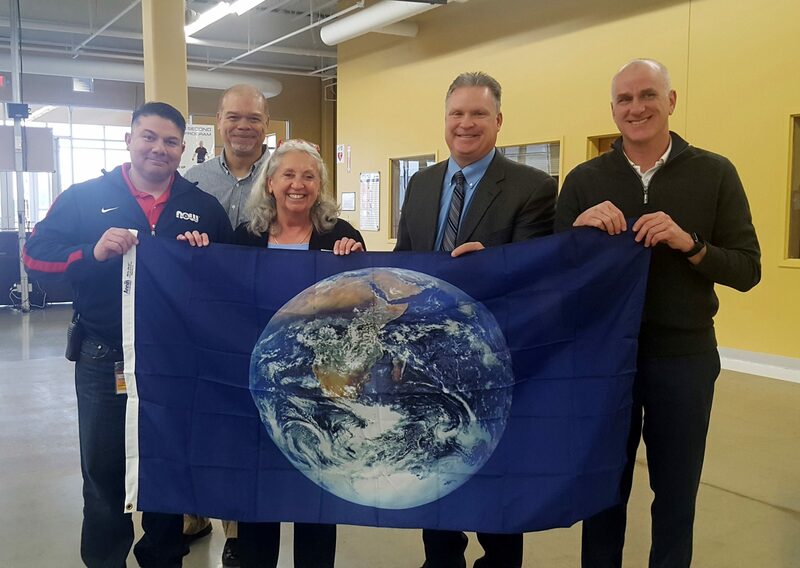 NOW Foods earned an Earth Flag from SCARCE ten years ago at their first facility. The company has since expanded and this past year took on the task of certifying it’s two additional campuses in Roselle and Bloomingdale as part of it’s 50th anniversary celebration. In addition to comprehensive recycling, both offices switched over to a green cleaning regimen to protect indoor air quality. They encourage staff to save energy and refill water bottles at refilling stations. Each campus has a low-toxicity policy for their landscaping and maintenance including native plants and integrated pest management practices. Both facilities also made the switch to LED lighting in 2018. Well done NOW Foods and thank you for your commitment to the environment! Students on the Superintendent’s Advisory Student Council from each middle school in Community Consolidated School District 93 participated in SCARCE’s storm drain medallion project this past month. They installed medallions on storm drains in Carol Stream and Bloomingdale to help educate residents to protect waterways simply by not dumping in drains. Going a step further, the group even made a video that was shared on facebook to spread awareness about the project and water quality protection. Way to go above and beyond! Each year on the Saturday after Thanksgiving a handful of towns provide a temporary drop-off location for residents to recycle their used cooking oil. In addition to five permanent sites that are open on Saturdays, the towns of Elmhurst, Itasca, Roselle, and La Grange Park offer residents the option to drop off cooking oil locally making it easier for their residents to properly dispose of leftover or expired cooking oil. 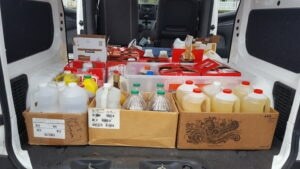 This year, over 200 gallons of liquid cooking oil was collected. This event was first organized by SCARCE in 2013 and helps prevent sewer clogs and protect water quality after a holiday that may have some families deep-frying turkeys in upwards of 4 gallons of vegetable oil. Thank you to both the permanent and pop-up locations for providing this service over the holiday weekend!